At its September meeting, the Nebraska State Historic Preservation Board approved three nominations submitted by Restoration Exchange Omaha (REO). If approved by the National Park Service in the coming months, the properties will be added to the National Register of Historic Places. REO staffer Patrick Thompson wrote the nominations. Holy Sepulchre was nominated because of its association with the city’s social development and as the primary burial place for the city’s Roman Catholic population during the late 19th and early 20th century. The cemetery is also associated with the lives of prominent Nebraskans who were significant to the city’s, state’s or nation’s history. Those interred there include Edward Creighton and Thomas Brennan. The cemetery is also eligible because it is an extant example of a vernacular landscape that developed during the “rural cemetery” movement. 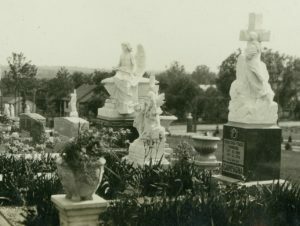 The cemetery’s mausoleums, monuments and carved statues are included in the nomination. 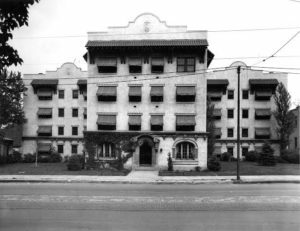 The Hanscom Apartments, currently known as the Bristol Apartments, were found to have significance locally as a surviving example of a Spanish Colonial Revival style, multi-story apartment building. The building was designed and built by Drake Realty Construction Company in 1921 to take advantage of the suburban development along Park Avenue north of Hanscom Park. The building was constructed in an unusual cruciform or “Maltese cross”-shaped four-story building on a concrete basement foundation. It retains many of its original exterior details. InCommon Community Development purchased the building in 2015 and is in the process of renovating the interior. The organization will continue to offer affordable-rate apartments in the building. The Scott-Omaha Tent & Awning Co. Building was found eligible for the National Register of Historic Places because it is a rare surviving example of a late 19th-century commercial building constructed for the purpose of manufacturing carriages and wagons and because of its significant architectural characteristics. The Omaha architectural firm of Blake & Zander designed the building for P.J. Karbach & Son in late 1893 for the production of wagons, carriages and related supplies. George Joslyn’s Western Newspaper Union, once the leading supplier of newspaper inserts, occupied the building from 1898 to 1916. 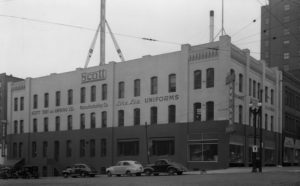 Scott-Omaha Tent & Awning (SOTA) leased the building in 1916 and purchased it in 1941. The building served as the company’s main manufacturing facility and appears to be where founder Allen C. Scott developed, refined and perfected his design of the “aviator’s parachute,” which served as the basis for parachute refinements and designs through the present time. REO “heart-bombed” the Scott building on Valentines’s Day 2016. As a result, the building’s owner became interested in its history and engaged REO to document its significance.